The Origami is an extremely clever and puzzling illusion invented by Jim Steinmeyer. Here's how it looks to the audience: A small box, about 12 inches square, is unfolded, becoming large enough for the assistant to enter it. Once she is inside, the box is again folded down to a small box. There is apparently no place for the assistant to be. Then, to further prove the lack of space, three long samurai swords are thrust through the box from all sides. The above photo illustrates this point in the performance. The illusion can be completely revolved, showing all sides. There is simply no place for the assistant to hide. Next, the swords are removed and the box unfolded, revealing the assistant. 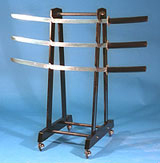 A stand with matching casters is also available to hold the mirror and swords. Features include an anodized aluminum box. The color is an applied vinyl which withstands abuse and continues to look new. The table frame features semi-transparent sides. 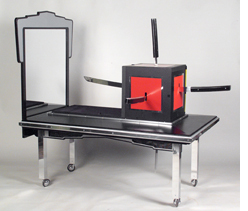 Also available is an optional stand (pictured at right) which holds the three swords and the mirror. The stand is lacquered in black with chrome trim and features matching casters. The stand easily breaks down and packs with the origami base. We also have available the Greg Frewin version (shown below) which features a broken and restored mirror effect. Instead of swords, the mirror is broken and three slivers of it are used to pierce the box. As a finale to the illusion, the mirror is restored. This version includes a special stand for the mirror.